Open and Shut? : Open Access: Where are we, what still needs to be done? Open Access: Where are we, what still needs to be done? Making Open Access (OA) a reality has proved considerably more difficult and time consuming than OA advocates expected when they started out. It is now 19 years since cognitive scientist Stevan Harnad posted his Subversive Proposal calling on researchers to make their papers freely available on the Web; and it is nearly 12 years since those who took part in the Budapest Open Access Initiative (BOAI) adopted the term Open Access, and agreed on a definition. However, few now doubt that OA is inevitable, and a number of developments this year have served to confirm that. In February, for instance, the US Office of Science and Technology Policy (OSTP) published a memorandum on public access in which it directed federal agencies with more than $100M in R&D expenditures to develop plans to make the published results of federally funded research freely available to the public within one year of publication. Then last month agreement was finally reached in Europe on the details of the next EU research programme. Amongst other things, this will require that papers arising from research the EU funds will have to be made OA. And two weeks ago G8 science ministers issued a joint endorsement of the need to increase access to publicly-funded research. In the meantime, OA mandates continue to be introduced by research funders around the world, including recently in Belgium, Denmark, Ireland, Iceland, and Australia. In addition, of course, on April 1st Research Councils UK (RCUK) introduced its highly controversial new OA policy, a policy that sparked a great deal of bad-tempered wrangling, and led to two inquires (here and here) and the publication of a number of clarifications. Yet many continue to have serious doubts about the policy, and fear its likely consequences. Indeed, opinions on the best way forward for OA remain generally divided. So where is OA right now, what still needs to be done, and what should be the priorities going forward? 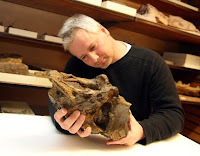 With the aim of airing the views of a range of different people on these matters I hope to publish a series of Q&A interviews in the coming weeks, starting today with Mike Taylor, palaeontologist, computer programmer and indefatigable OA advocate. Q: Why did you become an OA advocate? This is right on target. It's why I'm so frustrated by the compromises that researchers, librarians and even funders make to the legacy publishers. Those publishers are not our partners, they're our exploiters. We don't need to negotiate with them; we don't even need to fight them. We just need to walk away. Q: What is your definition of OA? A: The term “open access” was given a perfectly good definition by the Budapest Open Access Initiative back when it was first coined: “free availability on the public internet, permitting any users to read, download, copy, distribute, print, search, or link to the full texts of these articles, crawl them for indexing, pass them as data to software, or use them for any other lawful purpose”. Immeasurable confusion has resulted from people proposing alternatives – either through ignorance or malice. Let's stick with the original and best meaning of the term. Q: What should be the respective roles of Green and Gold OA? A: This actually isn't an issue that I get very excited about: Open is so much more important than Green or Gold. I suppose I slightly prefer Gold in that it's better to have one single definitive version of each article; but then we could do that with Green as well if only we'd stop thinking of it as a stopgap solution while the “real” article remains behind paywalls. So much for fundamentals. But when we come the current RCUK policy on Open Access, the specific conception of Green OA that it requires is badly degraded, to the point where it's not really open access at all. Green articles in the RCUK sense can be encumbered by non-commercial clauses, stripping them of much of their value to the taxpayer, and can be delayed by embargoes of up to two years – a truly disgraceful state of affairs given that the old RCUK policy only allowed six months. So in the context of RCUK specifically, Green is virtually useless, and the only way to obtain actual open access is by paying for Gold. Which I don’t doubt is exactly what the publishers wanted. It's to RCUK's eternal shame that they rolled over and allowed this, after having made such a strong opening statement. A: There are two very fundamental problems with hybrid OA. First, new born-digital publishers like Hindawi, PeerJ and Ubiquity have shown that open-access papers can be published at literally an order of magnitude less than the $3000 APCs that are typical of legacy publishers offering a hybrid option. It's not clear what proportion of that $3000 is simple profiteering (though the 32–42% profit margins of the Big Four suggest it's somewhere north of $1000), and what proportion is due to the cost of dragging the print-and-subscribe carcass around behind the OA operation; but whatever the reason, hybrid OA tends to be sensationally expensive. The second problem is that, while most publishers offering hybrid promise a “no double dipping” policy, it's plainly impossible for anyone to verify whether this is true — and probably impossible for the publishers themselves to know. When the subscription costs paid by any given library are closely guarded secrets, and when in any case virtually every journal subscription is part of a Big Deal, is it even meaningful to talk about how much the price of any given journal is reduced to account for APCs paid? I don't think so. The only way to move forward with hybrid is by taking the legacy publishers' word on the financials. And no-one with half a brain or a few months' memory is going to do that, when they have shown over and over again that they're not trustworthy. So, no, I am not a fan of hybrid! Q: How would you characterise the current state of OA, both in the UK and internationally? A: I'm constantly amazed at how much progress has been made in the last year or two, and constantly appalled at how much further there is to go. I think it's only gradually dawned on me just how many different ways the traditional academic publication game was broken – not just by publishers, but by administrators consistently rewarding the wrong things, and by researchers in every field and at every career stage finding special-pleading reasons why they can't be expected to be the ones who break free of the system. Still, there's no question that we're much further forward than even a short time ago, and we have a lot of momentum in mostly the right direction. It's just a delight to watch the streams of new OA mandates flowing from every corner of the world. We're nowhere near where we need to be, but we're moving fast towards that destination. A: Most fundamentally, we have to end to the childish notion that the value of a piece of research is dependent on what journal publishes it. The San Francisco Declaration on Research Assessment (DORA) is an enormous step in the right direction, and it's very heartening to see that it's been signed not only by the people you'd expect (PLOS, eLife, PeerJ) but by groups like the European Association of Science Editors and the AAAS, which publishes Science. Even Elsevier has expressed sympathy with the DORA (though without signing) which goes some way to showing how widely recognised this issue is. The problem for the legacy publishers (and the reason none of the Big Four has signed) is that the venue-causes-importance myth is the only thing keeping them in business. Soon the world will clearly see that newer journals do an equally good editorial job, but with fewer limits and better design, without paywalls and at lower APCs. And when everyone recognises that sticking to objectively inferior established journals doesn't magically make their research better, the jig is up for their publishers. They will have to compete on quality and price, rather than continuing to enjoy a monopoly based on owning the established journals. Once we hear the end of “I'd like to publish in Journal X, but I have to publish in Journal Y for my career”, everything will get much saner very quickly. I hope that today's new undergraduates won't even have to think about these issues. A: Education. Without exception, every single researcher, librarian, university administrator, government official and funding-body executive who understands open access is in favour – how could they not be? The great barrier to universal open access is not opposition but inertia. It's true that there is a whole industry doing its best to preserve ignorance of, and promote falsehood about, open access. But this deliberate damage is insignificant compared with the sheer weight of tradition. Maybe the best resource we have for education is Peter Suber's little book Open Access, which is itself open access, free to download as PDF, ePub, HTML or Kindle format (or to buy as a paperback). As well as laying out a persuasive case for why OA is important, it's particularly good on practical details of how various kinds of OA mandates work – just the kind of thing that busy academics and administrators need to know. Q: What are your expectations for OA in 2013? A: Nothing very surprising: the legacy publishers will continue trying to neuter open-access mandates, with some success; but more mandates will keep coming in. The PLOS journals will continue to grow in volume and recognition, eLife will push on, PeerJ will keep growing and pushing the envelope of what a modern journal can be, and no doubt more new OA initiatives will start up. At some point, I foresee a catastrophic collapse of barrier-based publishing, as a critical mass of researchers and administrators pulls up short and says “Wait a minute, what we've been doing makes no sense at all”. But I don't see that happening this year or next. The question then will be whether these legacy publishers can make the jump to embracing, rather than tolerating OA. My best guess is that they will do so initially, but quickly be out-competed on price and features. But again, not in 2013. This year, I just foresee consolidation. Which is important. I do hope this year will see a decision made on how to implement the White House OSTP's OA recommendation, and I hope that it will elect to do this by expanding its own PubMed Central system rather than by acquiescing to land-grab attempts by either publishers (CHORUS) or libraries (SHARE). Of the two, libraries are obviously more aligned with the world's interests than publishers are; but since the government exists in order to represent citizens, it seems like the safest bet. A: The best numbers I have suggest that OA is going to cost us about 9% of what we're currently paying in subscriptions — in other words, we'll be able to save more than nine tenths of what we're spending now. Here's how I work that out. The STM Report for 2012 estimates $9.1 billion in subscription revenue for English-language journals, with 1.8–1.9 million articles published. That's an average of $5000 for each article. By contrast, Solomon and Björk (2012) found an average APC of $906 across 100,000 articles for which they were charged; but since only about half of all OA articles attract APCs, the true average is half that, or $450. No doubt there is some slippage in these figures; the final result could easily be out by a factor of two in either direction. But even allowing for that, it's evident that a Gold OA economy is going cost a small fraction of the current subscription economy. Finally, I love it that your questions end with “Does cost matter anyway?” That's the key issue. OA is cheaper, but that's not why it matters. What counts is not that it has lower cost, but that it has higher value. The real cost in all this is the opportunity cost of not having universal open access. Mike Taylor is a mathematician by training, a library software engineer by profession and a vertebrate palaeontologist by avocation — so he combines a unique set of perspectives on academic publishing. In his day-job Taylor designs and builds discovery systems for libraries, managing credentials and proxies to access subscription journals. In his spare time he researches the palaeobiology of sauropod dinosaurs, struggling to access the subscription literature that he needs for this work. An open access advocate, Mike has written for the Guardian, Independent and Times Higher Education. He holds a Ph.D in palaeontology from the University of Portsmouth and is currently an Associate Researcher in the Department of Earth Sciences at the University of Bristol. The second interview in this series -- with Stevan Harnad -- can be read here. Hi, Stevan, good to hear from you. But don't you think it would have been more polite to wait for Richard to get around to doing your interview before giving your answers? Yes, I'm well aware of the history of the terms "libre OA" and "gratis OA". I understand the distinction and why it's valuable. I also understand (as will anyone who reads it) that the original definition of the term OA explicitly limits its use to "libre". What you and Peter did with those terms, however well intentioned, did contradict the original definitions. The thing that you call "gratis OA" is indeed an important and valuable thing. But we would all be much better off had you found a different term for it rather than co-opting the existing term "open access", and thereby diluting its meaning. Then we and others could have had much clearer discussions of the relative importance of open access and zero-cost-to-read access without getting constantly mired in misunderstandings of what the terms mean. Hi, Mike, thanks for suggesting I should have called what I've been advocating for over 2 decades something other than OA -- but I guess it won't surprise you that I disagree! I don't quite see why you think of my responses to your responses to Richard's questions as "dissertations" -- they don't look to me any longer than your responses. But I was wondering whether your only point is terminological or you want to engage more substantively with what I was actually saying, as I did with what you were actually saying? After all, as you say in your comment following my responses to Richard's questions: we "seem to disagree on virtually every detail of how to proceed towards OA" -- and I definitely agree with you on that! Hi, Stevan. It's true that you have been calling no-charge-to-read access by the term "open access" for some time (and advocating it, to great effect, for even longer). But that doesn't change the fact that your idiosyncratic use of the term "open access" is different from the way it's used by virtually everyone else. I suppose your comments look like dissertations in part because they come in multiple chapters and have titles. Don't just ask me -- others also find them difficult to engage with. Surely you've noticed that they tend to have the effect of shutting down conversations rather than opening them up? To finish positively, there is a an important broad point to be made here: while it's true that you and I disagree on many points of terminology and strategy, our positions look indistinguishably close from the perspective of legacy publishers. We focus on the differences because those are more interesting to discuss than a sequence of "Yes, I agree that everyone should have access". But that core assertion is at the heart of everything we're doing; and fundamentally at odds with the business model that still, stupidly, dominates academic publishing. This seems like a good start to the series of interviews: Two of the most energised, committed, and articulate advocates for Open Access (but who belong to different generations of the OA movement) publicly delineating what they share in common and what separates them. One is, however, tempted to suggest that there is another broad point to make here. That is, that OA advocates have been outlining the points on which they agree and those on which they disagree for some 20 years now. Yet while they have finally succeeded in convincing the wider research community, research funders, and even publishers, of the merits of OA, the bad news (for OA advocates) could be that their continuing disagreement on terminology and strategy is allowing publishers to appropriate OA to their own ends, and recreate it in their own image. I cannot help but think that the situation would be different today if the OA movement had created an OA foundation, or some similar organisation, as I suggested they should in 2006. (Stevan Harnad did support the idea by the way). But is my characterisation of the situation accurate or fair? Either way, I do hope I can persuade a publisher or two to provide some input into this discussion. In the introduction to this piece I wrote, "Few now doubt that OA is inevitable". On the Liblicense mailing list the publisher Anthony Watkinson has expressed disagreement with this statement. Watkinson says, "My impression from conversations with librarians, publishers and scholars is that most now see OA as probably a default model and a primary model, but part of a mixed economy with purchase by users however organised continuing as part of the picture of scholarly communication for the foreseeable future." I assume Watkinson read my statement as a prediction that all scholarly publishing will become OA. This might indeed happen, but I was not predicting that we will inevitably see 100% OA, more that it will (as Watkinson himself anticipates) become the dominant model. How that is funded, of course, remains a huge issue. I certainly think we'll soon reach a point where enough work is OA that content-mining project stop frittering away time in negotiations with paywall providers, and just proceed with the material that's freely available to them.